Good Saturday Morning sweet blogging friends. Today's post is about letting go of a vision and moving on to see what might work next! 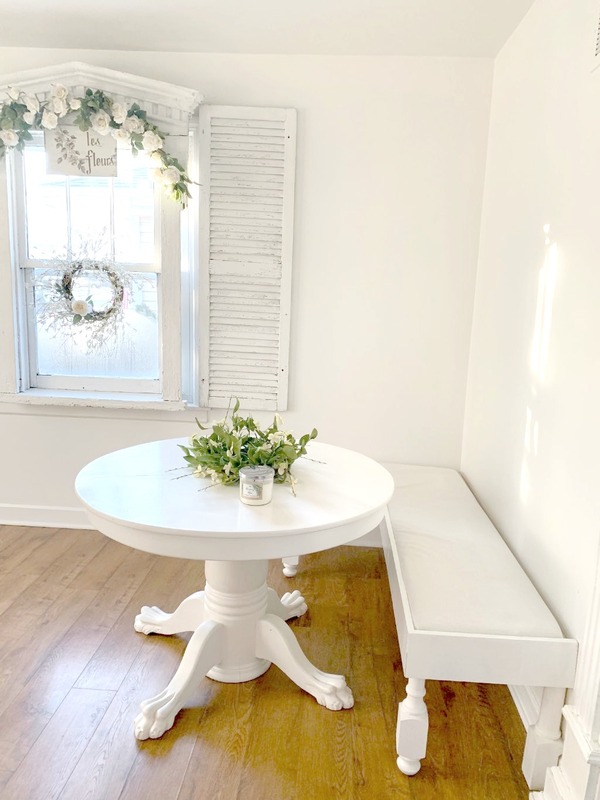 As many of you know I have been trying my hardest to make the tiny corner of my living room into a dining area. 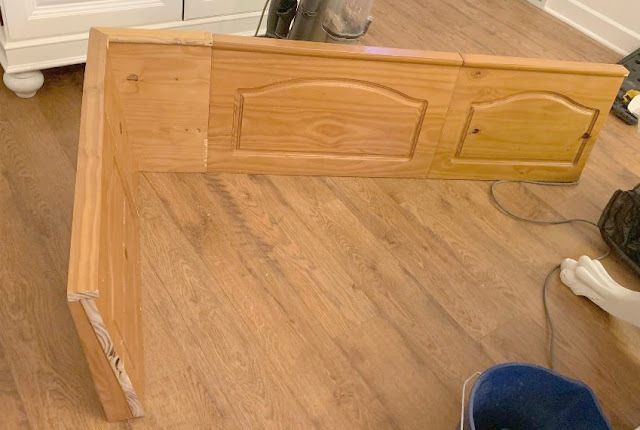 The answer seemed to be going in the direction of a banquette. I found this piece for $40 dollars on Offer Up. Terry thought he could cut it down to fit the spot and we would work from there. It easily came apart for Terry and his trusty tools to try and make it fit in the space. Re making the back pieces to fit. Adding new fun legs to the base looked great too. I was excited this might work. I started to add the foam pieces to cover the wood. This is where we ended up. NOPE!!! With adding fabric in a neutral and then thinking about painting the legs and base just was not felling right. It looked like a booth in a restaurant and not what I had envisioned. I have thought about adding some kind of wall ship lap or find an antique head board etc. to make this look more finished. It just was not going to be what I envisioned. I also want this to be comfortable to sit. So my new vision is to find a settee for this space against the wall and then maybe a couple of fun chairs. This is my friend Des's loveseat/settee. 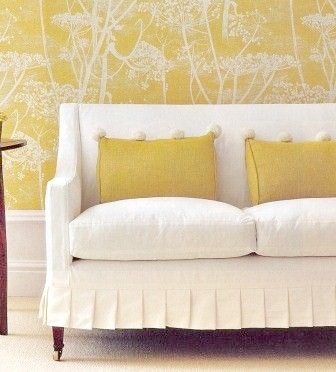 This is an inspiration photo for me to find just the right settee. I have always loved this piece she has in her home. This is another inspiration photo from Miss Mustard Seed Interiors. I love this piece she did with her chippy paint technique. I love the deconstructed look of this piece too. I found a talented girl in Michigan near the shops I love to frequent. I contacted her and she said she would work with me on a slipcover over a settee. 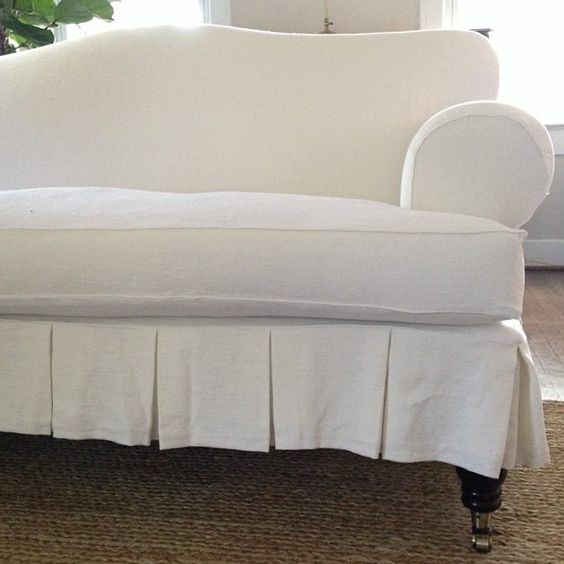 I also reached out to my slipcover angel Lisa from Fabric's 8 for a price quote for her to make one too. I just have to find the right settee. I love the box pleat on this with some of the fun leg showing. This is a sample of a settee I can buy on line fairly inexpensive and then have a slipcover made for it. This is one of the looks I could get too. 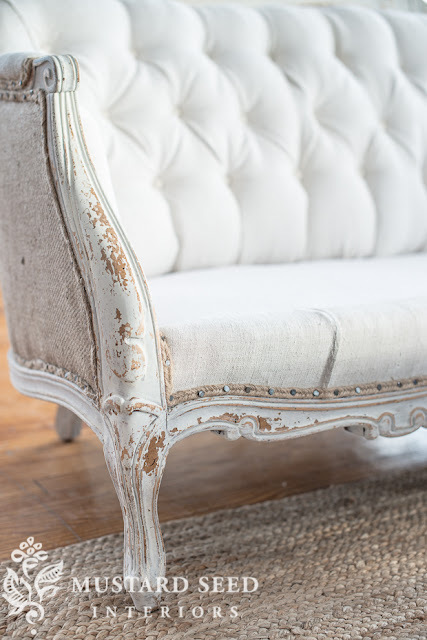 I will hunt down a small settee and then see about having a slipcover made for the piece. I think this will be the best solution for this small corner space. Stay tuned I will keep you updated on what I might find. 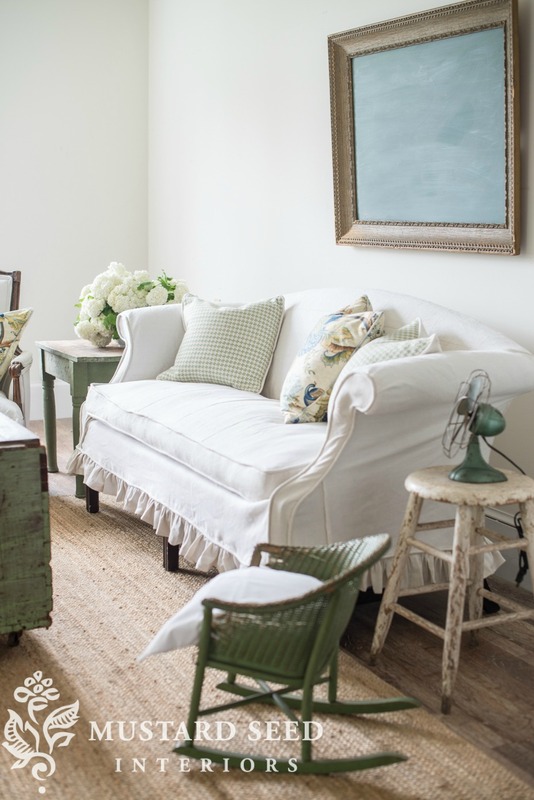 If any of you know of anyone that is selling a slipcovered settee like my inspiration pictures please let me know. I have exhausted all my connections here of shop owners etc. to find one already done. I think I am going to have to find a settee on line and then have a slipcover made for it. Good News!!!! Pottery Barn called and they set up delivery of my new sectional for next Saturday. Yeah!!!! Hopefully then this room will begin to feel like a cozy spot in my house. I know just how you feel!!!! 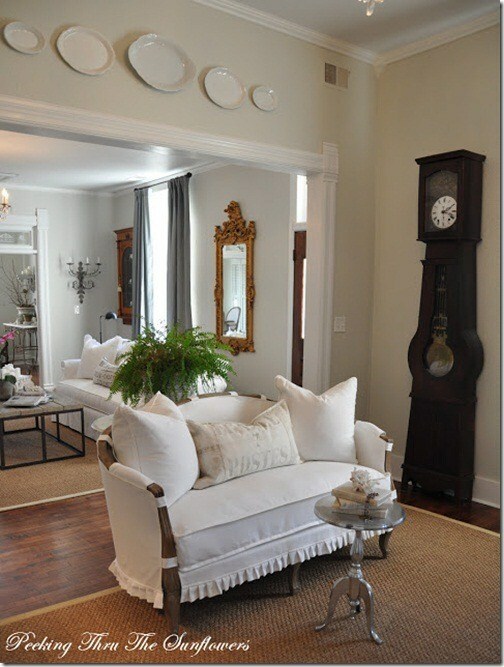 The original vision for my front parlor did not work out and I had to adapt and come up with a new plan. In the end I really feel the room turned out better than my original vision. 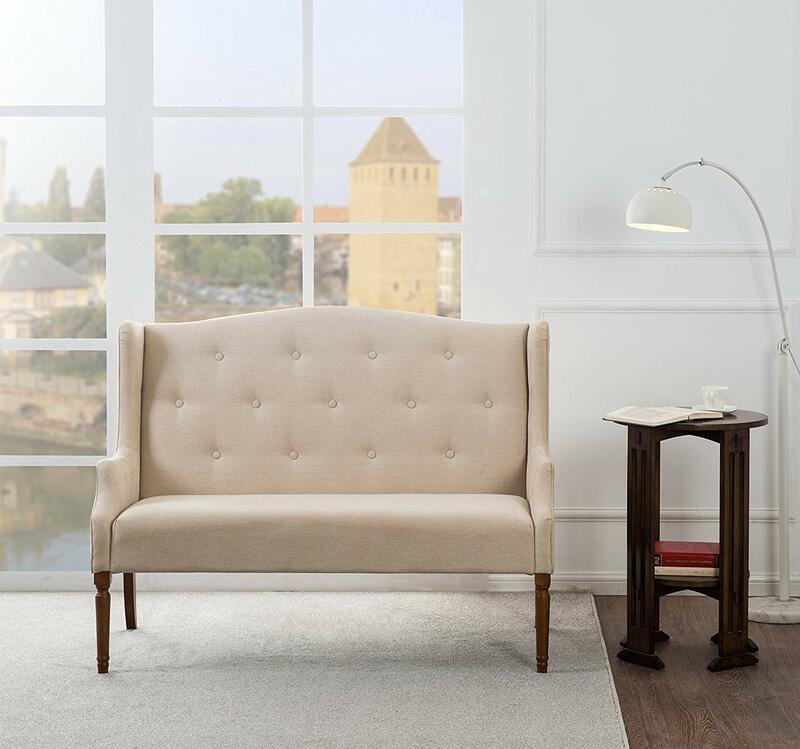 I think a settee will be just perfect for your space and it will turn out better than you ever imagined! I am so flattered that you love my settee so much that you posted a pic of it!!! It is from Wisteria and I made the slipcover myself. It might be re-appearing in the side parlor :o) Good luck with your search!!! Have a great weekend!!! Sometimes you just have to play around to get exactly what you want! Sending "pretty settee" vibes your way!! You know when something will work or not. I love that you are determined and will get it right. There are some pretty pieces online. I know you will find a piece and make it great. Love your inspiration and have to say I'm really liking this choice. 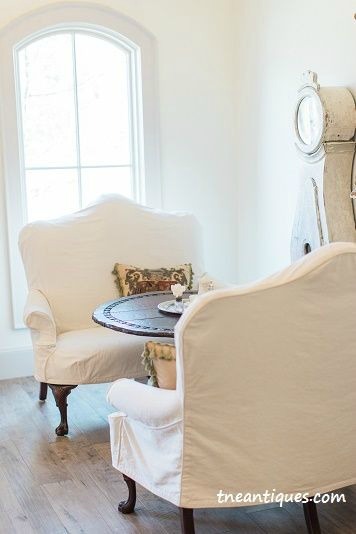 I love the idea of a settee, but maybe just use 4 chairs since it is a tight space and you can find some really cute open back chairs so they don't take up any space visually. You'll know more when you get our sofa. I had a settee like that for a while but I gave it away. Anyway, I'm a long way away from your neck of the woods. I hope you find something that works for you. I'm sad the banquette didn't work out for you. I love how you are able to "let go" when something just isn't fitting your inspiration. A settee will be sweet. I found a settee with the right dimensions for a similar purpose. Started taking the fabric off in hopes of reupholstering it for myself and thought easy peasy, as I have reupholstered many a chair. 8 months later it still sits 1/2 way stripped. So many differing layers of staples UGH. I wished I had been able to just slip cover, but this piece smelled heavily of cigarette smoke and I was sure it would wafted through a slip cover. I have full confidence in your ability to find the "just right piece" It will be lovely when completed. Best of lucking finding what you want! 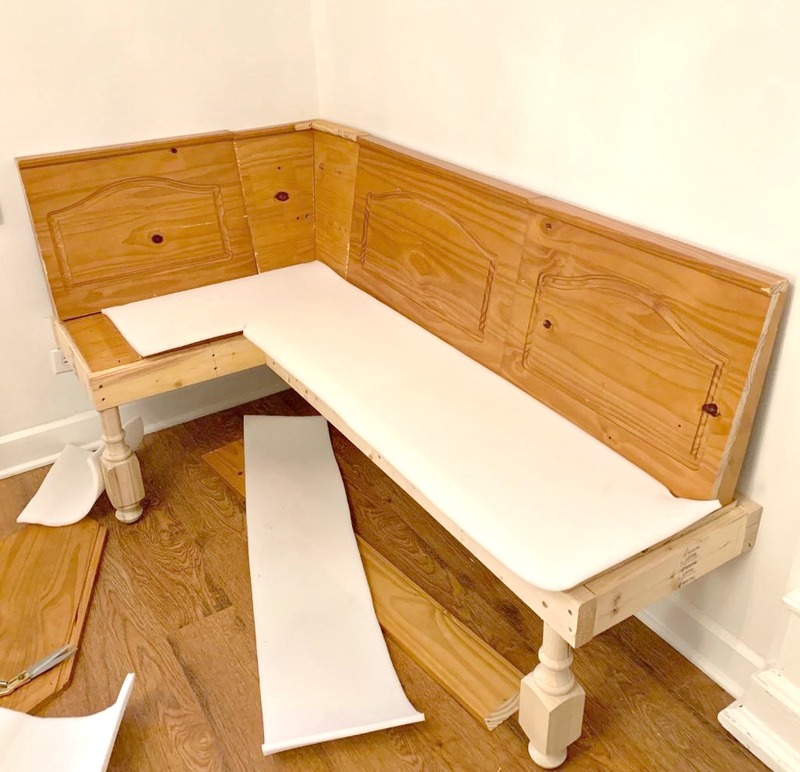 Well, even though your banquette didn't turn out the way you envisioned, at least you and Terry are so creative and handy, that you always make things work out somehow. 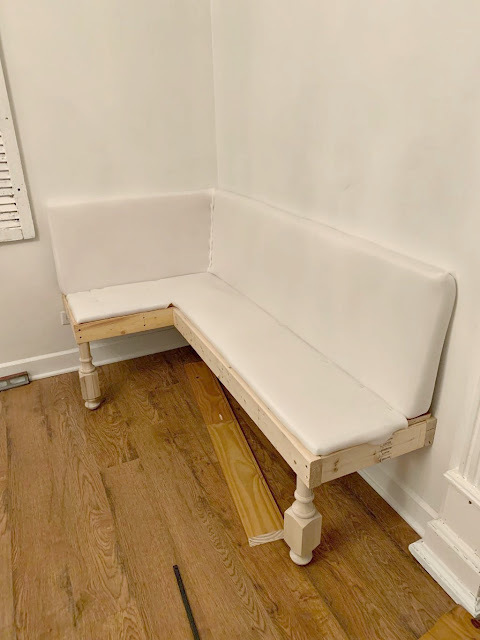 Can't wait to see how you end up styling this bench and hooray on your furniture being delivered soon! Good Luck Kris, I understand the frustration. I was in that position when we were designing the boys play room. My husband did end up building me what I wanted for their Lego's, because I could not find it anyplace. I totally get where you're coming from, Kris. I've had quite a few ideas not work out as I'd planned at the new place. Mostly because I didn't have the space that I had thought I'd had. You and Terry are quite a team, so I know whatever you come up with will be wonderful. Thanks for sharing the process, so frustrating to go thru it all and have it not be "right". Can't wait to see your new sectional! GOOD MORNING! I was out all day in the snow yesterday, so I'm barely getting into blogland.Oh Kris, you are an inspiration in yourself. When one thing doesn't work, then you move on to the next possibility. Possibilities are fun because that's what gets us to work: we get an idea, then the actually building, searching, tweaking begins. I think your decision to get a settee is a good one because you can always move it to clean, to try out in another spot...brilliant. GOOD LUCK my friend, in finding just the right one! Just when you think you lose hope....BAM! PB will shift your focus with delivery of that sectional, I betcha, Kris. 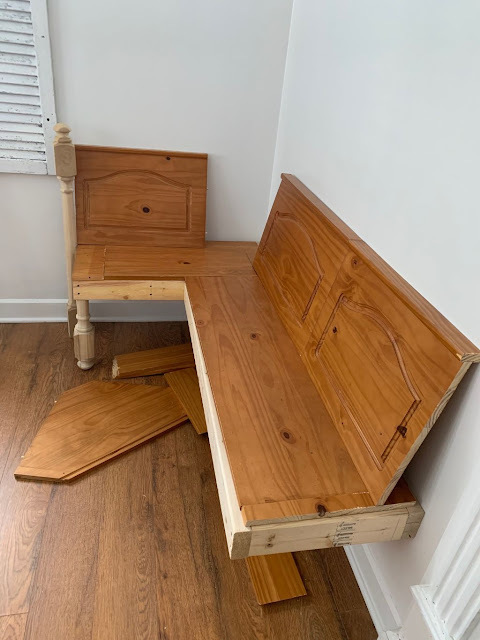 Maybe let that sink in before you spend money online for a settee that might not work. It'll come together. I love all your inspiration photo options. Oh Kris, it'so disheartening when it does not turn out the way you had dreamed of it being. I have no doubt it'll even be better than your original dream! You are so creative, I am sure it'll be just beautiful! Yay for the call from Pottery Barn! 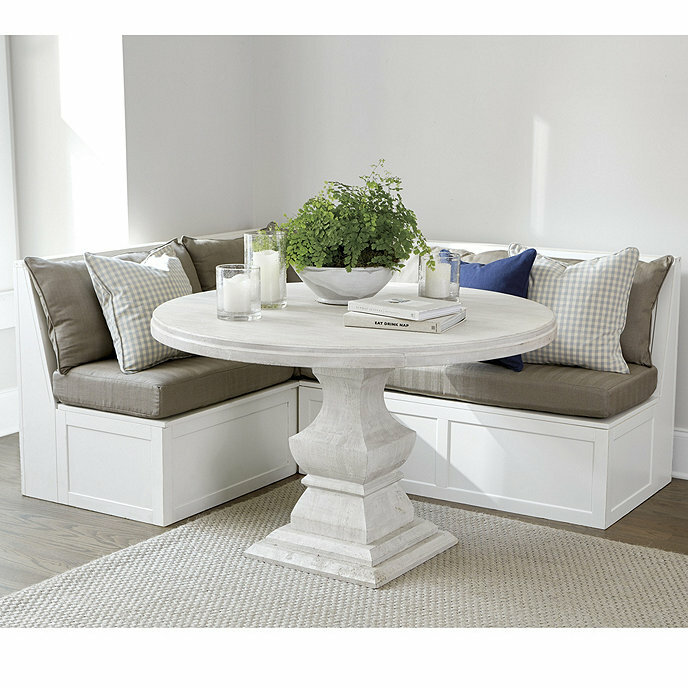 Seeing the inspiration pictures does make me think that they look more "you" than the banquette. I know you will know when it's right and I admire you so much for realizing that it needs to be right and not just something you put up with for years. I'm so glad the sectional delivery will be soon! That will be exciting to see it in place! Stay warm and have a nice week. Terry is so sweet to keep working with you on your vision. I know that it will all come together soon and it will look perfect. I think a settee will look best. Don't you hate when you work and work and it just doesn't come together? Sometimes it's very difficult to find what a space needs. But you'll find the right piece. It's always an experiment, isn't it? Sometimes it comes together, other times you have to change it up. You two are the best at doing that, Kris! Are you aware that someone using Keto 180 Shark Tank is commenting on your posts just as a form of advertisement? I do not see any comments from anyone that is connected to Keto 180 so not sure what you are seeing. If they are anonymous then they cannot comment on this blog. 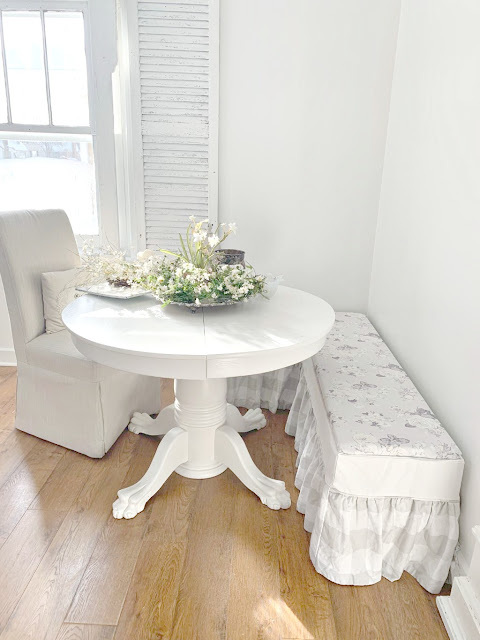 I love the look of the banquette but I think it has to be in a bigger space so I understand why you changed your mind. 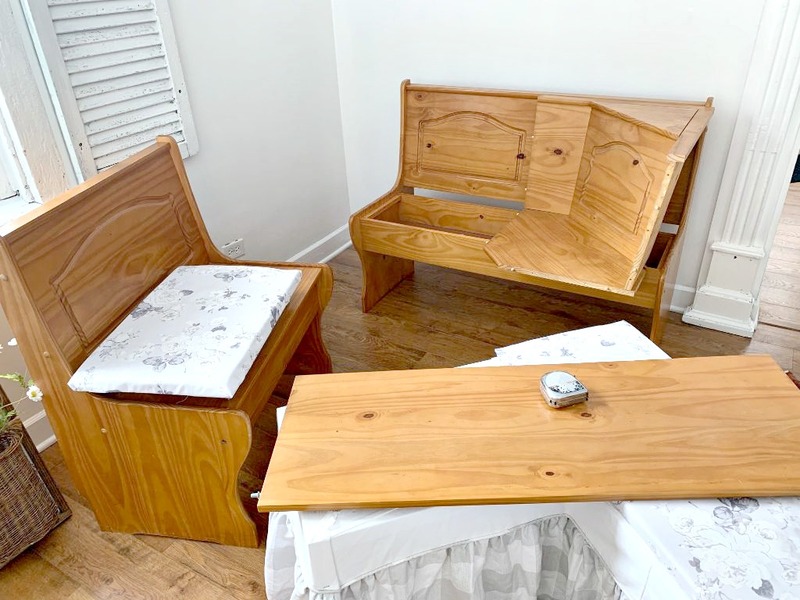 I have a bench and it's not comfortable for a relaxing dining experience. I love how Terry works with you to bring it together. He is a patient man. I told my husband I want to strip some wallpaper off the wall and pull off some tile and he almost fell over. #husbandfail You'll make it come together as you always do. The journey is as much fun as the destination! LOL yep Terry is pretty patient with my crazy. He has herniated a disc in his back from slipping on the ice and now is waiting to see if he will need surgery. He is taking it easy and trying to let the meds kick in and work. He is going to have an MRI on Wednesday to see what they will do next. So my handy man is out of commission. Oh how frustrating, Kris! Why didn't you get the corner piece from your original inspiration photo? Was it not available? Anyway, I know eventually you'll get it worked out and it will be gorgeous like the rest of your house!! I know you two will come up with the right solution to your corner...when you least expect it something will come your way...looking forward to your new furnishings!! Wow! What a decorating dilemna! I really liked the idea if the banquet. Sorry it didn't work out. Maybe it would be good to wait until your sectional comes to check for placement before you get a settee. Would an eating area work in your kitchen where you had that island? I can't tell without seeing it. I hope you get it all sorted the way you want it! I'm sure it's been frustrating! Have fun and keep us posted!